Prior to the development of modern vaccines and antivirals, colostrum and raw milk from domesticated ruminant animals was utilized by civilizations across the globe. Colostrum and raw milk were and still are today a primary source of nutrition for many rural communities in developing countries. These dietary staples provide essential nutrition for growth, development, and protection against pathogenic microbes and in turn, better health and survival within these communities. Colostrum use was determined by experience not by scientific knowledge per say, but today, both play an important role in the emergence of colostrum as a nutritional supplement. Peer-reviewed research has since replaced anecdotal testimonials and now offers evidence of bovine colostrum’s preventative and therapeutic action. Read more from the world’s foremost authority on bovine colostrum for human consumption, Douglas A. Wyatt. As founder of Sovereign Laboratories, Mr. Wyatt is credited with establishing the gold standard in processing raw bovine colostrum into supplements. With twenty-five years in the field of colostrum research, Mr. Wyatt was an early developer of liposomal delivery (LD) for enhanced bioavailability of colostrum and other nutritional supplements. Sovereign Laboratories and its non-profit, Sovereign Health Initiative, are leaders in consumer health education, professional continuing education and successful practice enhancement for medical and healthcare providers. 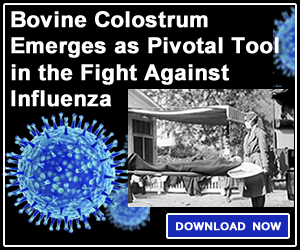 Sovereign Laboratories offers a full line of powdered bovine colostrum supplements and concentrated oral health sprays derived from the immune-modulating components in colostrum. Colostrum-LD® is considered the premier foundational supplement for optimal immune and gut health, and it was designed for optimal health and successful aging no matter where one is on the spectrum of life. For more information about introducing your patients to colostrum, visit www.ColostrumTherapy.com/ihs. This whitepaper is provided free of charge and underwritten by a sponsor. Following your download, you may be contacted by the sponsor with information about their products and services.